Kind of funny story...well now it is after the initial panic. I tried to fry my iPhone this week. Literally. I put it on the cook top instead of a pan!! I had a pink case on it, melted that. Luckily, the iPhone is genius and goes into a mode where it recognizes the temp is too hot and temporarily shuts down. My phone was like a hot potato!! Too hot to even hold! We put it in the fridge for a while, it was like new!! I left in a little longer for safe measure!! LOL! Moral of the story, I'm trying to do too many things at once and not paying attention. I'm counting down the days until Spring. I cannot wait for sunshine and warmer weather!! Anyone who has been reading my blog for a while, knows I'm not a fan of snow, cold temps and gray cloudy days. I decided to infuse the house with a little spring with finishing my "Daisy Table Mat" from Primitive Gatherings!! I actually have been working on this since last April. I finished all the stitching last August while on vacation. I just need to finish up the back. Here's a close up of some of the detail, which makes all the difference. This is what it looked like before. What a difference!! 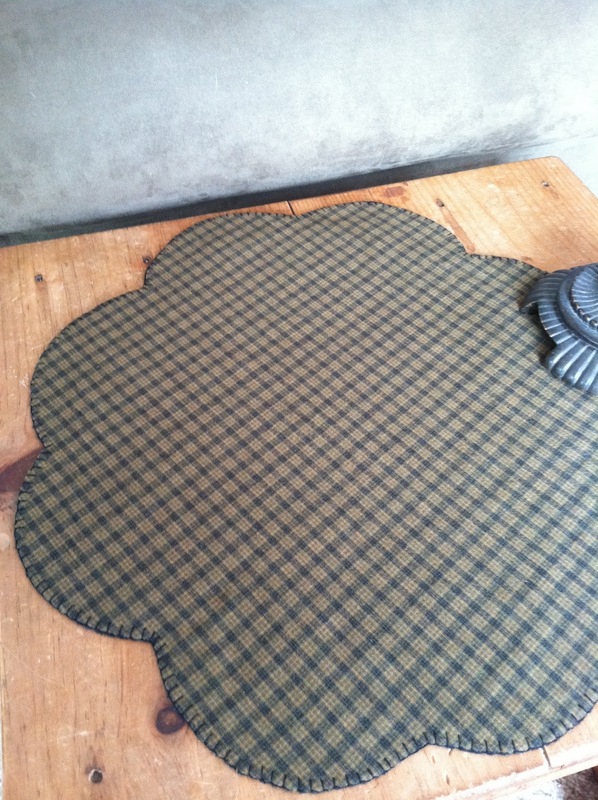 I noticed while at Primitive Gatherings, how flat all the wool mats and penny rugs were. Mine never lay flat like that. During our time with Lisa Bongean, she really gave us a lot of pointers on how to achieve that. Especially when applying the backing and stitching around the mat. How you press makes a huge difference and use lots-o-steam!! I am pleased to say my mat is flat as a pancake and perfect! Looks good at night too! I LOVE it!!! I little spring is just what I need! The mat finishes at about 18". 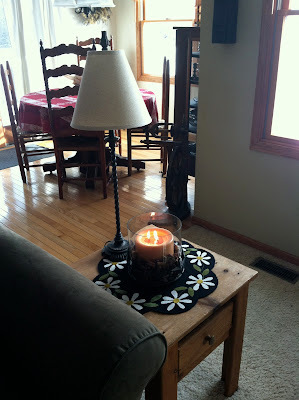 The candle holder with glass chimney is also from Primitive Gatherings. I ordered it a few years ago. I love it too. I change the candle and fixings based on the season. Love the new mat!! I love Primitive Gatherings patterns...I have a ton and this year I am going to make more of them for my house! It seems like they always get made but then given away as gifts!! Yours turned out perfect and brings in a nice touch of Spring!! Your mat does look good. Nice and flat. I cut the backing about an inch bigger than the mat on one of my projects. By the time I was getting it all turned under and stitched, it was not large enough. And all I was turning under was about 1/4". Evidently the wool stretched. Congratulations to Elaina! I know you are proud of both of them, I can hear it in your voice. Good luck on making spring come faster! I'll be wishing with you. 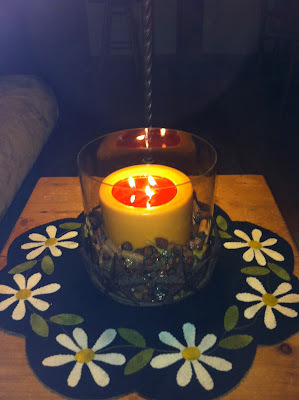 The candle mat is wonderful - and so cheery for this time of year - good idea. The bond between twins is amazing and maybe something that "singlets" don't understand - we always want the best for our twin. It is a different relationship than to other siblings. Have fun with the sleepover!! Love the candle mat and hope it helps with winter time blues. So glad your phone is okay! Your funny story makes me smile. You have too much to do! Love that candle mat. I don't work in wool but can see it in cotton too! Very cute! 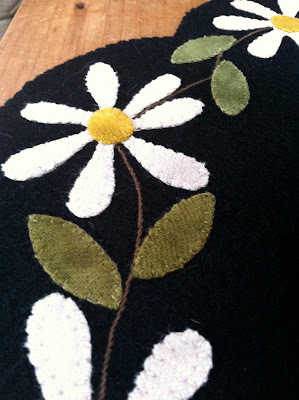 Love your Daisy Table mat. So pretty. Very worth the finish. Glad your phone survived! I put my empty yogurt container in the sink and my spoon in the trash this morning! Luckily I realized my mistake as soon as I let go of the spoon. Beautiful piece, perfect for spring. Just adorable, Linda, and so spring like! Congratulations to Elaina and to Alyssa for being a fantastic, supportive sister! That's kinda funny about your iphone - how cool that it knows to shut itself off! I look forward to your wooly Fridays! The daisy mat is so adorable!! Congrats to Elaina for the achievement:) It is nice when our kids do well. What an honor for your daughter, and it reflects on your parenting skills as well! Congratulations to all of you. This world needs more people like you. And the fact that you're handy with a needle is even better! I love your Daisy Table Mat. It's a sign of whats around the corner. congrats to Elaina. so good that her sister is so supportive. Love your wooly mat. Perfect to cheer during the winter months. What a cute mat. Thanks for the ironing tip. Gorgeous mat, just the thing to brighten up a grey day! And congratulations to Elaina! And to Alyssa for being such a lovely sister! Congratulations to Elaina and the whole family on such a special award!! Woohoo :-) Funny iPhone story. I didn't know it would do that! 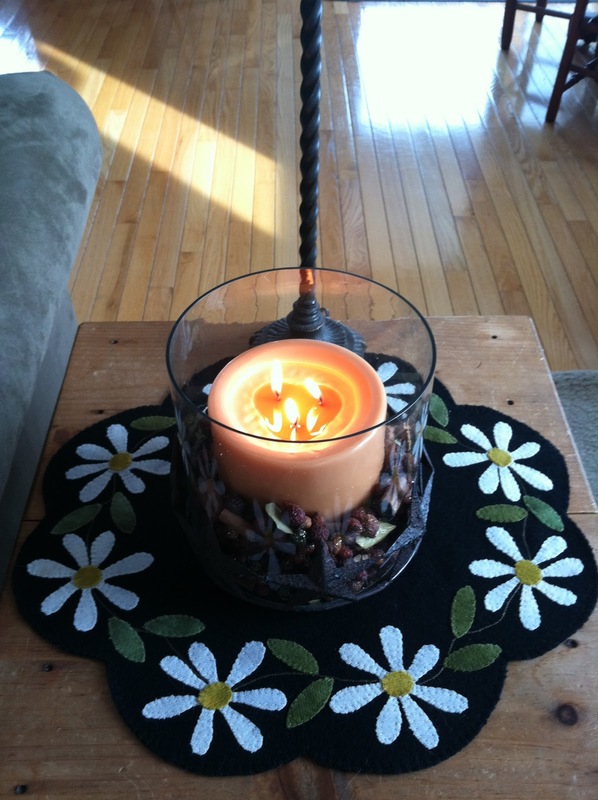 Great candle mat! I just got out my wool Valentine mat and I was thinking of making another. Yeah...I can read and make comments again. Love the mat. Just ordered fabric to make the spring valance, from our fav fabric store. I hope all is well ... I have missed you!